Very functional and seems sturdy. Really like that this is made from recycled materials and being a part of reduce/reuse/recycle. I would recommend this to anyone. 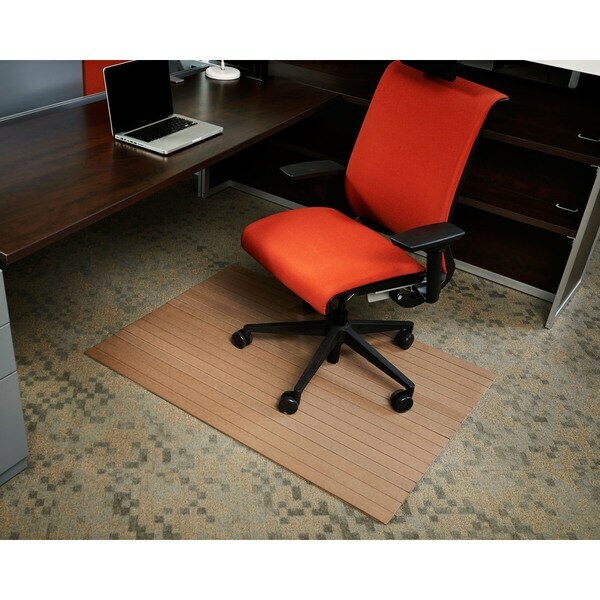 This Jani Eco-natural composite chair mat is an exciting innovation for your office space that brings modern styling and superior durability. The chairmat provides a smooth rolling surface for your office chair and works with both low pile carpet and hard floor surfaces. "what are the dimensions of this floor mat?" Hello waterwitch09, If you click on the options scroll down it will tell you each size available with the price. Please feel free to contact us again with any further questions. Thank you for shopping with us! If you love both older and newer interior design styles, modern farmhouse is ideal for your home. Think of modern farmhouse as an update on the classic country farmhouse style. It pairs the sleekness of modern and industrial design with the warmth of a classic farmhouse look. While it might seem like an unlikely duo, modern farmhouse is a match made in heaven. Your front entryway serves as an introduction to your home's decor and design. Use these stylish entryway ideas to create a picture-perfect space with a professionally designed appearance. The bold, classic style of Art Deco interior design is still alive and well. Read on to get a feel for what makes Art Deco furniture and decor stand out. Computex Anti-Static Advantagemat | PVC Chair Mat | Rectangular with Lip | Size 36" x 48"